depending on from when and where you are joining us. to the CDC Public Health Grand Rounds for September 2017. We have an exciting session, so let's get started. But first, a few housekeeping slides. We are available on all your favorite social media sites. to the Grand Rounds email box at grandrounds@cdc.gov. Want to know more about healthy aging? to our website called Beyond the Data. It is posted shortly after the session. This month's session features my interview with Dr. Baumgart. to feature scientific articles about healthy aging. The full listing is available at CDC.gov/scienceclips. a display about healthy aging. Here a preview of the upcoming Grand Rounds session. Please join us live or on the web at your convenience. of the individuals listed here. for me to be part of this session. from CDC's deputy director, Dr. Schuchat. >> Thanks so much, Phoebe. And thank you all for joining us today. but some of us are saying that 80 is the new 60.
to reach their 100th birthday. but the potential deterioration of brains as we age. of cognitive loss in loved ones. for relatives in a territory we had never planned for. and the implications for public health. about the topic of healthy aging. to hit the key points that you're going to hear. that you can keep up with the key points. and introduce a moment of poetry. about aging -- by Jenny Joseph. this may seem particularly apropos. which doesn't go, and doesn't suit me. in other people's gardens, and learn to spit. with today's Public Health Grand Rounds. And now for our first speaker, Sarah Lock. I'll do my best not to spit -- I'll save that for afterwards. as well as the challenges we face as our population ages. Then I discuss some strategies to promote healthy aging. and it is not merely the absence of disease or disability. along with ongoing social engagement. Aging is society's greatest achievement. than in all previous human history. and young adults and improved the lives of millions. of the century when life expectancy was only 47.
into their 90's and beyond. from 1946 to 1964 are also declining. of our population age 65 and over by state. Darker colors indicate a higher percent of older population. of their population age 65 and older. and two states will have crossed the 20% mark. of 65, and nearly half of all states exceed the 20% threshold. that older people can share with their communities. only behind the United States in its entirety and China. because of the value they bring to the workforce. from a lifetime of work. and call for help when necessary. to a diverse work environment, including people of all ages. much more racially and ethnically diverse. by 24 percentage points, from 78% to 54% or almost 55%. to all people in all cultures. the fastest-growing age group is those age 85 and older. And the second-fastest is the those 100 and over. And a majority of those people are women. at the same time the 85-plus will triple. will exceed 400,000 people by 2050.
and it will be by 44% between 2030 and 2040.
to increase only by 10%. to 64 to each person 80 and over. to increase 17% and the 45 to 64 population increases by 8%. such as hypertension, diabetes, and arthritis. with regard to lifespan and health span issues as well. and are having to work longer. So we need to make sure they're healthy and can do so. by their living situation or lack of social supports. of the national prevention strategy. and empowering people to make healthy decisions. All of these ideas are relevant to make healthy aging a reality. independent, and involved in their community. and emotional social well-being of adults. and facilitate healthy aging in communities. to keep older adults healthier and more active. or no access to transportation. the Ride to Wellness Initiative. of missed medical appointments due to transportation issues. who have limited transportation options. and body's health as you age have been well documented. and some cancers compared to those who are less active. by offering them near polling places. against the influenza flu during 2010 to 2011 winter. and was active in all state. visiting nurses services, and pharmacies. strategy to reduce racial and ethnic vaccination disparities. Medicare is the primary payer for healthcare for older adults. to Medicare to promote increased use of preventative care. and functional ability are reviewed. and physical activities are also reviewed. to promote ongoing use of clinical preventative services. and helps to keep vaccinations current. to catch conditions before they become serious and more costly. of Medicare recipients had an annual wellness visit in 2014.
because research is at the early stage. and cost were compared to those of a control group. costs by healthcare settings, and health services utilized. and fall-related fractures were also evaluated as appropriate. So how can we promote healthy aging in our communities? and professions to create incentives to work together. that address adopting healthy behaviors over lifespan. with the Global Council on Brain Health. It's now my pleasure to introduce Matthew Baumgart. >> Thank you very much, Sarah. about one of those chronic conditions, Alzheimer's. But I want to back up and start with the concept of dementia. that is severe enough to interfere with daily life. of which is Alzheimer's disease. a person with dementia has more than one cause of that dementia. then you did not have Alzheimer's disease. with a long continuum where dementia is only one stage. the data have not caught up. about all people with the disease. not a public health issue. But that view is changing. and address Alzheimer's as a public health crisis. and there are ways to intervene. And Alzheimer's meets all three of those criteria. that dementia was the most expensive disease in America. in the United States for older Americans. and the number of deaths from Alzheimer's has increased 110%. who develop the disease at greater rates. of $230 billion in unpaid care each year. and diagnosis, and management of co-morbidities. by addressing certain risk factors. that midlife obesity was a risk factor. for your heart is good for your brain. about preventing dementia, not just cognitive decline. and the needs of caregivers. for preserving a person's cognitive health. and disclosure of that diagnosis. to a healthcare provider about their memory problems. with Alzheimer's today have not been diagnosed. of the diagnosis -- unaware. and those who are diagnosed are not being told. benefits to an early and disclosed diagnosis. to do so, and address driving and safety issues. So there's a big gap for public health to fill here. and using validated assessment tools. through culturally appropriate public awareness campaigns. who are aware of the diagnosis. that can be done medically to treat Alzheimer's. And this makes costs go up for a couple of reasons. as I mentioned, are preventable among people with dementia. than probably anything else is diabetes. with a cognitive impairment self-manage? that usually does not happen. with diabetes but not Alzheimer's. across a variety of conditions. on the right path of care. and fewer emergency room visits. that's part of this process. and Medicaid nearly $700 million over ten years. opportunities, I believe, for public health. dementia and start seeing it in public health terms. to address the growing Alzheimer's crisis. of the National Alliance for Caregiving. >> Thank you so much, Matthew. about the caregiving aspect of this. on caregiving issues across the lifespan. that was conducted with AARP. with activities of daily living. public heal issue, what is we really mean? this is roughly the same size as the population of Argentina. to a friend, family, or a neighbor. it would cost the US economy $470 billion a year. and it affects people from all backgrounds and walks of life. men and women are equally as likely to be caring for someone. like changing wounds, using a catheter, giving injections. caring for someone, most people are also working. but they're also raising children in their household. and financial needs, and your own personal needs. This slide is from the Caregiving in the US data. where the primary reason is cancer and dementia caregiving. and service providers and government agencies. to be engaged in these activities. or walked you through how to do these activities. and by 24% at 180 days. such as a nursing home. but it puts the care recipient at risk. the caregiver's own health will decline. such as depression and anxiety. of income out-of-pocket to pay for the costs of care. that it's nearly $7,000 a year. they spend as much as $9,000 a year. that promote health and well-being. that science has said works. for dementia, but also other conditions like ALS and TBI. of themselves so that they can care for others. from a hospital to the home. but also for many caregivers. to manage those chronic diseases as they grow older. of an individual caregiver to provide care. through new Medicare billing codes. but it's not fully prevalent in our system of healthcare today. as a member of the healthcare team. by AARP called the CARE Act. and is usually disseminated through the Aging Network. as well as access to respite care. for those caring for veterans. on the level of need. to help caregivers offset the costs of care. such as caring for a grandparent or an in-law. which can help caregivers manage that work/life balance. of resources are available across the United States. I think all of us have a stake in supporting family caregivers. If we're not one now, we either will be or we'll need one. and remaining independent as long as possible. for a person who has a cognitive impairment. And I'm going to highlight our efforts in each of these areas. of cognitive decline as part of public health practice. who are currently facing this disease. as an additional driver for CDC's work. on the Behavioral Risk Factor Surveillance System. Subjective cognitive decline is a common precursor to dementia. It is a self-evaluation of one's memory functioning. module in 2015, 2016, and 2017.
in both 2015 and in 2016.
and are more likely to live alone. and those who might lack caregivers. and older who indicated if they were a caregiver. as a caregiver, and what their greatest care needs are. if they expect to become a caregiver in the next two years. that administered the module in 2015, 2016, and 2017.
in both 2015 and 2016.
and mental health of caregivers? and physical distress, as well as obesity. of the health and well-being of older Americans. and the accomplishment of the roadmap activities. through the remainder of the presentation. The Balm in Gilead initiated Memory Sunday in June of 2017.
with nearly 4,000 participants in them as well. to a doctor appointment regarding memory concerns. in changes within this population. of education efforts related to brain health and dementia. of the National Black Nurses Association in 2016.
in partnership with the National Medical Association. with dementia and also their family caregivers. to the primary care physicians. with their existing primary care structure. to public health agencies in seven states. who are residing in communities. across the continuum of their care. on the BRFSS and other surveillance systems. of analyzing the recently released 2016 BRFSS data. in addition to increasing supports for caregivers. but just improve awareness that will actually result in action. of Alzheimer's disease and related dementias. of persons with a cognitive impairment and their caregivers. and remaining as independent as long as possible. And now I want to open the session up for questions. please make sure you submit your questions electronically. or move to a microphone. if we have any questions remotely. >> We have several questions online. to read and play ball? >> Sarah, do you want to take that? >> Sure. Thanks for that question. and find purpose in their community. I can recommend AARP's Connect2Affect. in their communities throughout the country. to find ways to engage with your community. Susan, did you want to comment? and how can they find more information on that? >> That -- I'd like to follow up with you about that. Because there are enormous opportunities for that. to live independently in their communities. for you to address that specific question. >> And we can post that on our Grand Rounds website. to get accommodations through the ADA. And a lot of people aren't aware of that. >> And then we had a question in the room. and sharing that with us. and we can tell what's working to prevent. and highly specific ways to diagnose early? by the Centers for Medicare and Medicaid Service, CMS. and the Alzheimer's Association are doing it. that can detect amyloid on the brain. of healthcare, and on the diagnosis? its utility in order to approve its coverage under Medicare. at an earlier point in the process. And so this is a very exciting study. that were released last summer that were very, very promising. And so that's one potential. Another is the ongoing research for biomarkers. does that mean you have Alzheimer's? So does it work both ways? on this PET scan, can you use that as a biomarker? And so that's additional research that needs to go on. and that is a study called the DIAN trial. that guarantees that they will get Alzheimer's. and they will get it at a very young age. that we know are going to get it. or 40 years is extremely difficult in a study. whereas me, we don't know that. on the horizon about diagnosis and prevention. to Susan one more time. of the young old or early prevention for the young old? >> So I will, again, mention livable communities. and older people find really helpful. I think, part of the best way. of maintaining your health over age as you age. Fascinating session, a lot of good stuff. Please join me in thanking the speakers. please pop down to the library and see their display. And thank you very much for joining us. We'll see you next month for Public Health Grand Rounds. CDC experts discuss the impact the aging population will have on their caregivers, the public health system, and themselves. The population of older Americans is growing and living longer than ever. As a group, they are living active lives and contributing to the economy. The added years to the lifespans have resulted in a longer middle age—extending the period when workers are at their most productive and creative. Aging brings an increase in the prevalence of chronic diseases, such as hypertension, diabetes, arthritis, and dementia. For example, Alzheimer’s disease, the most common type of dementia, is the 5th leading cause of death among older Americans. Older adults also face more challenges with everyday living activities. Birth rates are declining, posing a potential shortfall of caregivers, and that trend will continue. Caregivers themselves are at risk for health problems. Trends show they will be working longer hours and caring for people with more than one chronic disease. 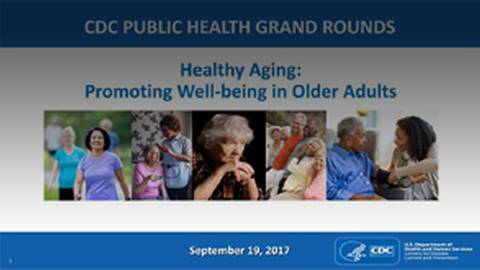 In this session of Grand Rounds Nation from CDC's Public Health Grand Rounds, experts discuss the impact the aging population will have on their caregivers, the public health system, and themselves.